Celebrate the club's first gallery show by attending the reception at the Sidney Gallery in Port Orchard. Finger food and drinks will be provided. The awards for 1st, 2nd and 3rd place entries, plus honorable mentions, will be announced during the reception. George Dale of Prosser is a member of the Mid-Columbia Woodturners. George has given demonstrations at the AAW international, national, regional and local levels, as well as video demonstrations. He has more than 25 years of experience as a wood turner. George specializes in hollow forms, large diameter work, urns and furniture. Regular Meeting - Stephen Hatcher: "How Did You Do That?" Stephen Hatcher returns to OPCAAW for this month's demonstration using slides and explanations on the lathe to explain the planning and execution that goes into his pieces. 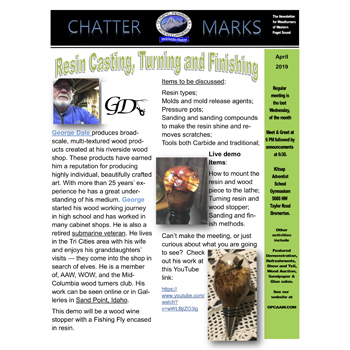 Hatcher, an Olympia resident, has demonstrated internationally and at AAW national symposiums, as well as at regional and local turning gatherings. His techniques for creating inlays in platter rims were the subject of his demonstrations at the 2018 AAW Symposium in Portland. The regular monthly meeting of OPCAAW features a demonstration.